Death (Finally) Comes To Pemberley and PBS! Death Comes To Pemberley, the adaptation of P.D. James‘ best-selling mystery novel has finally come to PBS in all it’s Regency splendor! Death, stars Matthew Rhys (The Americans, Brothers and Sisters), Anna Maxwell Martin (Bletchley Circle, Bleak House) and Matthew Goode (The Imitation Game, The Good Wife) and the doctor’s current companion, Jenna Coleman. Lovely Jenna Coleman without her Doctor! Written as a continuation of Jane Austen‘s most beloved novel, “Pride and Prejudice”, and taking place six year’s after Elizabeth (Martin) finally accepted Mr. Darcy’s (Rhys) proposal, the story finds the Darcy’s happily ensconced at Pemberley and preparing for their annual ball when tragedy strikes involving Wickham (Goode) and Lydia (Coleman)…after all, where trouble is, can Wickham be that far behind? Still the bad guy getting in trouble…Mr. Wickham. 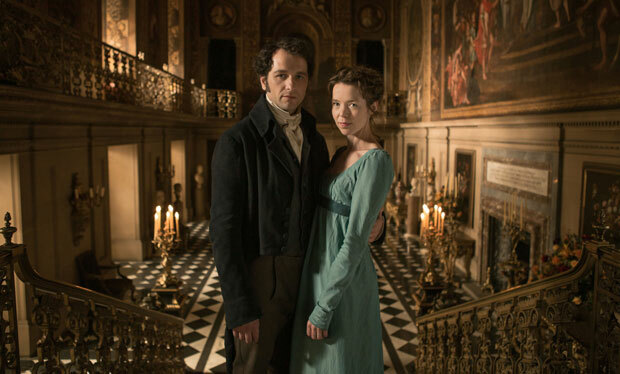 Filmed on location at some of Britain’s most sumptuous estates including Castle Howard (The Buccaneers), Harewood House and my favorite, Chatsworth (Jane Eyre and 2005’s Pride and Prejudice), Death Comes To Pemberley promises to combine all that we love about Jane Austen with a bit of murder and intrigue thrown in the mix. One the eve of the annual Lady Anne ball at their magnificent Pemberley estate, the silver gleams, the kitchen bustles with activity, the grounds evoke serenity and order, and alongside her husband Darcy, Pemberley’s Lady Elizabeth presides. Together, they welcome their guests: Colonel Fitzwilliam, Darcy’s severe cousin and a newly-minted heir in a dutiful search for a wife; young lawyer Henry Alveston, a sincere admirer of Darcy’s gentle-natured sister Georgiana; and the histrionic Mrs. Bennet and her long-suffering husband. Unwelcome and uninvited are the Wickhams. Yet the pre-ball festivities are brought to an abrupt halt when a coach races up to Pemberley carrying an hysterical Lydia Wickham, shrieking “Murder!” Darcy leads a search party and discovers the old thorn in his side, George Wickham, distraught and covered in blood, dragging the body of Captain Denny, whom he’d pursued mid-argument into the dark woods. All evidence—now in the hands of the magistrate Hardcastle, an old Darcy adversary—points to Wickham’s guilt. Has Wickham committed the ultimate crime? 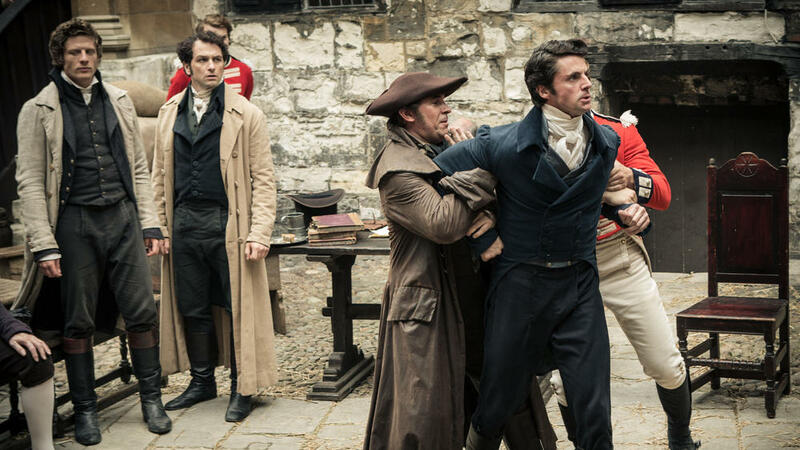 And innocent or not, will he finally damage Pemberley and its residents beyond repair? 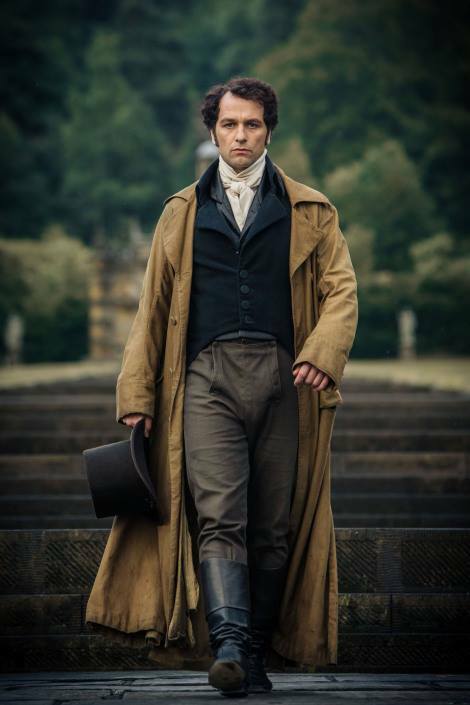 Matthew Rhys has some big shoes to fill as Mr Darcy! The movie is rated TV-14…which I’m quite curious about. My 12-year old daughter is a huge Jane Austen fan and is eager to see this adaptation. I certainly hope we’re not going to be seeing Mr. and Mrs. Darcy in the altogether…I don’t think Jane would approve! Death Comes to Pemberley comes to MASTERPIECE Mystery on PBS, Sunday October 26 at 9PM. 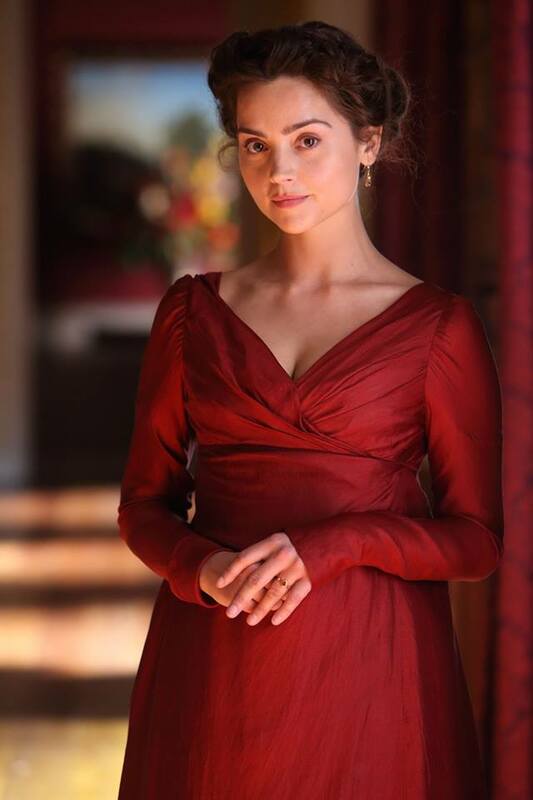 Lady Anglophile…Regency gown on, tea in hand…and ready to watch! This entry was posted in British Telly, Lady Anglophile Reviews & Other Bits and Bobs. Bookmark the permalink. 1 Response to Death (Finally) Comes To Pemberley and PBS! Great series and, in my humble opinion, better than the book itself!